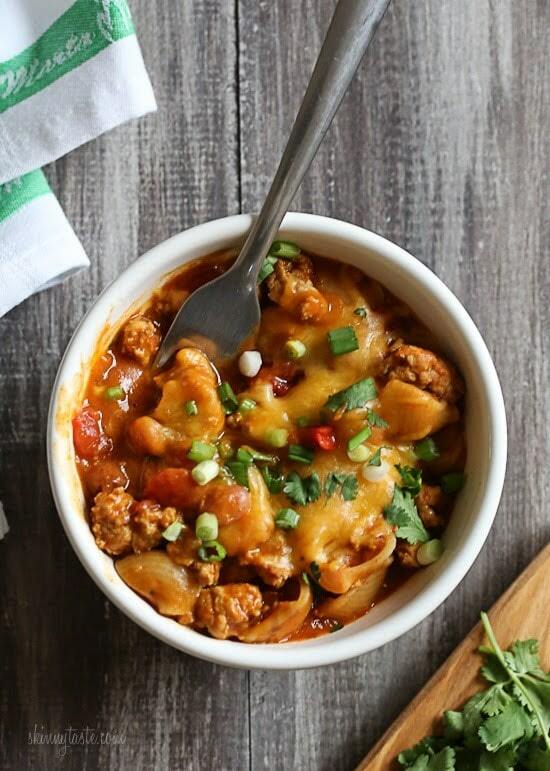 This easy, protein-packed One Pot Cheesy Turkey Taco Chili Mac recipe made with taco seasoning, beans, and pasta shells topped with cheese is a favorite in my home! Bonus points for dirtying only one pot! 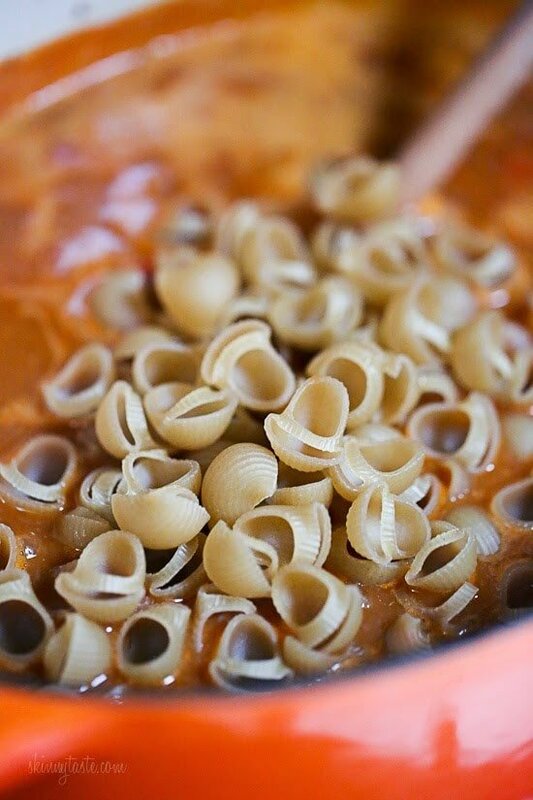 Chili mac and cheese is pure comfort in a bowl and thanks to the protein and fiber, it’s also filling and the perfect family-friendly recipe. If you love chili as much as me, you may also enjoy this Quick Beef Chili Recipe or my most popular Slow Cooker Chicken Taco Chili. You can use white or whole wheat pasta in this recipe, but I wanted to make this a gluten free dish because my aunt who is gluten intolerant was eating with me. I’ve heard all good things about DeLallo Gluten Free Pasta from my friend who swears by it and I was honestly blown away. It was by far the best GF pasta I’ve ever tried, in fact I even prefer it over whole wheat and I ‘m thinking I might be using this pasta all the time. Great taste, firm texture with the perfect al dente bite. And I loved how it didn’t get soggy after sitting in the chili hours later. Although Madison wouldn’t eat this because she won’t eat beans, I gave some to my friend Tara to test out on her finicky 5 year old son and he LOVED it! 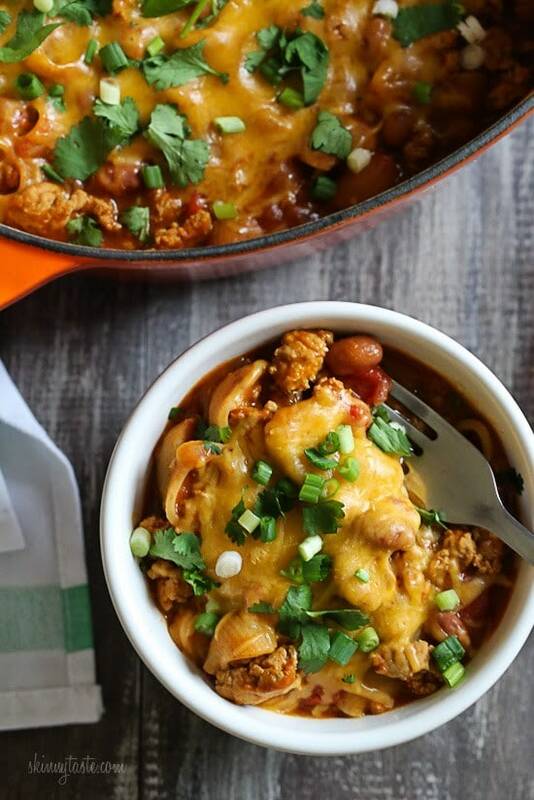 This easy, protein-packed One Pot Cheesy Turkey Taco Chili Mac recipe made with taco seasoning, beans, and pasta shells topped with cheese is a favorite in my home. Bonus points for dirtying only one pot! Heat a large Dutch oven or pot with a fitted lid over medium-high heat and spray with oil, brown the turkey breaking it up with a wooden spoon as it cooks. When cooked through, add the onions, garlic, pepper and taco seasoning; cook 2-3 minutes. Add the canned tomatoes, beans, tomato sauce, refried beans, chicken broth and water. Bring to a boil, cover and simmer about 15 minutes. Adjust salt to taste. Stir in the uncooked pasta and simmer uncovered over medium heat until al dente, about 6 minutes or according to package directions. Remove the pot from heat and top with the cheese, cover and let sit for about 2-3 minutes, until the cheese melts. Serve immediately garnished with fresh cilantro and scallions. I’m not a big fan of chunks of tomatos… should I substitute the tomato’s you recommend for another kind? Would it make it watery? The package of noodles only came in a 16Oz container, Your recipe only calls for 8Oz of noodles, so I should only use half of the package correct? Just made this in my instant pot and it came out great! Cooked for 3 minutes and then let it NPR for about 5! Did you cook it with the pasta too or add it in after? I used regular rotini pasta too! And I was in a hurry so I grabbed a packet of all natural fajita seasoning in place of the homemade taco seasoning. Hubby loved it! How could I make this in a slow cooker? Its perfect, but not sure when to add noodles if I did it in a slow cooker. I love this dish. I was wondering, can you cook this in the InstantPot, and what method would you use? Thanks! Yes how can we make this in the Instant Pot!! How many servings is this? Thanks! This has turned out to be one of our staples for ski trips. I make ahead up to adding the water, chicken broth, and pasta. Then I divide the meat, beans, and tomatoes into three freezer bags. The frozen blocks keep our cooler cool on the way, and don’t thaw much on the trip. Once on the mountain, I thaw a package, add water and chicken broth paste, and a few ounces of pasta. Fifteen minutes later, it’s time to dig in. A perfect end to a good day in the snow! Thanks, Gina! This was delicious! I used tofu instead of turkey – one family member is a veg – and used garbanzo beans instead of pink or red – one kid won’t eat any beans except garbanzo – and sneaky me still used the refried beans but the picky bean eater didn’t know they were there! Did everything else as is – everyone loved it! 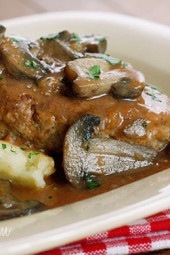 The spices are the perfect blend and the refrieds lend a nice depth of flavor to the sauce. 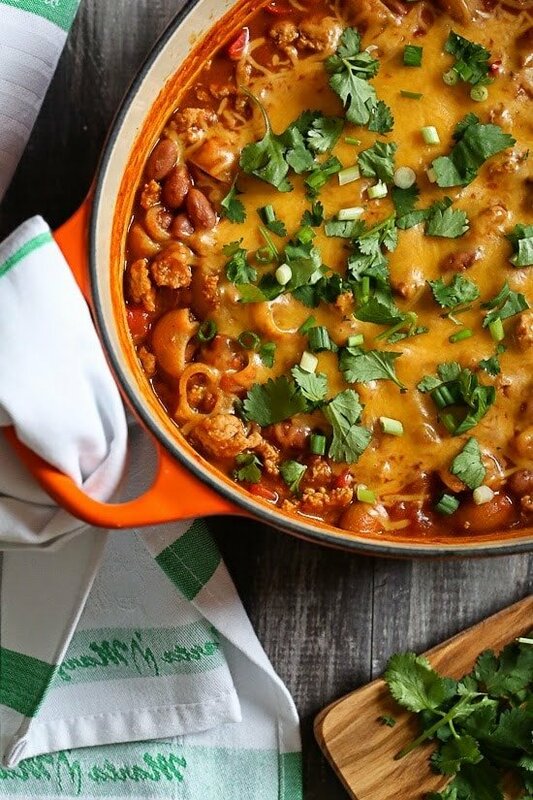 Making this for the second or third time…when the world is overwhelming (which it is for me right now, for a variety of reasons) a delicious one pot meal is the best thing in the world. Love this! Glad you enjoy it! Comfort food! Have you tried this in the slow cooker? If so any adjustmemts? How do you prepare to make it freezer friendly? New to the whole Freezer Friendly aspect of meal prepping! Thanks for the help! Absolutely another hit. Loved this and family approved. I’ve made several of your recipes and I was impressed with all of them. I have a question about the 8 oz measurement for the pasta. I did not have the de Gallo pasta. When a recipe says 8 oz of pasta does that mean 8 oz by weight or volume? I fretted over that. In Canada our packages and cans are in grams or ml (which drives me crazy) so I have a 500 gram bag of shells. I used 2 cups and dinner was good … but I would like to know the answer for the future as I use US measurements for all of my cooking. 8 oz is equal to 1 cup. Easy conversions on Google. I always have to as well. Actually my mistake it’s 2 cups. Pasta can be hard to measure I guess. ? I made this last night for family dinner and it was s hit! Thanks for sharing your great recipes!! OMG! This was the BOMB.com!!! I tweaked the recipe a bit: double the pasta, only .75 lb of ground turkey, an extra 1/4 cup of cheese and half an extra can of the rotel. This made enough to feed a big family or, in our case, a couple with big appetites and enough left over to have a second dinner! The mister says it was a keeper and he is super picky! I loved it as well. Can’t wait to make this again!! Just want to say that this is a staple in our house… We make it at least twice a month!!! Can you convert this recipe to a CrockPot recipe?? Maybe just brown the meat first and then add all the ingredients except the pasta until the last 20 min??? Can you make this in crockpot? And if so, how? Not sure, I haven’t tested it. Made this and only did 1 cup water. Turned out great but I sure hope it freezes because it makes a ton! One of my favorite dishes so far! so easy to make and soooo good!! Made this a couple of nights ago, and it’s definitely one of my favorite Skinny Taste recipes! The refried beans make such a creamy sauce without any milk or cream. I’ll certainly be making this again! This was amazing!!!! I put avocado on top. So good!!! I made this on spur of the moment and it was indeed a winner among the WHOLE family! 2 thumbs up!! Thank you for yet another big family favorite!! Good recipe! I used whole wheat pasta which took closer to 12 minutes to cook. I used the whole 15 ounce can of retried beans and it was nice and thick. Hi. I wanted to thank you for your recipe. I used a taco seasoning pack instead of making my own & used regular shells instead of the GF kind. I omitted the cilantro & scallions as I didn’t have any on hand. Like a previous commenter, my end result was pretty watery. I will probably cut back on water next time. Silly question – but are the red or pink beans kidney beans? Or do they refer to the other types of red/pink beans you see in some Cajun or Caribbean recipes? Thanks – will be making this tomorrow! I too would like an answer to this! I have dark red kidney beans on hand so I will be trying that, but I would like to know which type was intended. Either works, it won’t matter. Absolutely delicious!!!! Made this for the 1st time this evening and everyone just loved it. I have yet to come across a recipe from your site that hasn’t been a winner so thank you for all the wonderful recipes. This was a huge hit in my house, and we can’t wait to have the leftovers tomorrow. Thanks for another winner! Also, since I am dairy free, used Trader Joes almond mozzarella cheese and was delicious. Will make again!! I did this recipe today and loved it. Added 1/2 jalapeño to give it some kick. Also, I used Trader Joes GF brown rice/quinoa pasta and instead of 8 oz, had to use all 16oz because if not it was a soup. Is your amount of pasta correct, because with only 8 oz was soupy. I made this for my family and the flavor was incredible! It’s definitely a great option for comfort food without consuming an entire day’s worth of fat and calories. I also love that you make your own taco seasoning. I definitely will be making this again… and again. I don’t have refried beans at the house. Would this still be good without them? This recipe was AMAZING, seriously. I will definitely be making this again! Love all of your recipes, thanks! LOVE THIS! It tasted even better as leftovers. Thanks for all of the amazing recipes. Is the calorie count correct? I get something different. My husband lifted the lid and said "this is my dream dinner"
Thanks again, Gina for another winner dinner. LOVED it! Have you ever made this in the crock pot Gina? I made this a couple of weeks ago and forgot the refried beans, but it was still delicious. My fiance liked it so much he's asked me to make it again and double it so he can have leftovers! Has anyone else doubled the recipe? Just wondering if I should adjust any cooking times or temperatures. Thanks Gina! Made this for dinner tonight, another great meal. Plus lunch tomorrow! Made this last night, but with only three slight differences. 1. 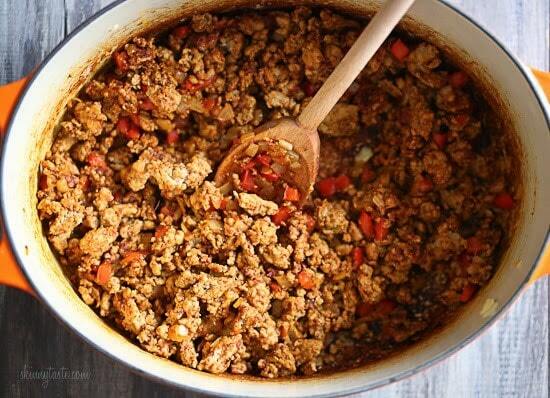 Used ground chicken instead of turkey (what I had on hand). 2. Used Pinto Beans (that's what I had on hand). 3. Only used 1 cup water by mistake (not 1 3/4). Followed all other ingredients exactly. It turned out GREAT!! Had just enough seasoning, cheese, and meat ratio. Will definitely be making this again! Thank you!!! Made this tonight and my entire family loved it! This will be part of our monthly meals! This was good. I used 2 cans of tomato paste in place of the refried beans to "thicken" the sauce, did water instead of the chicken broth and cut out the salt to make it more "sodium friendly" for 451 mg instead of 893. I made this last night and it was super yummy! Plus it didn't take more than 30 minutes to make, thanks for all your amazing recipes!!! Made this last night and made the mistake of accidentally cooking the pasta in a separate pot. Apparently I can't read! Anyways, I would highly suggest not making the mistake I did. It left the pasta a little unflavorful. Otherwise, this was yummy! This was a huge hit in our home tonight! 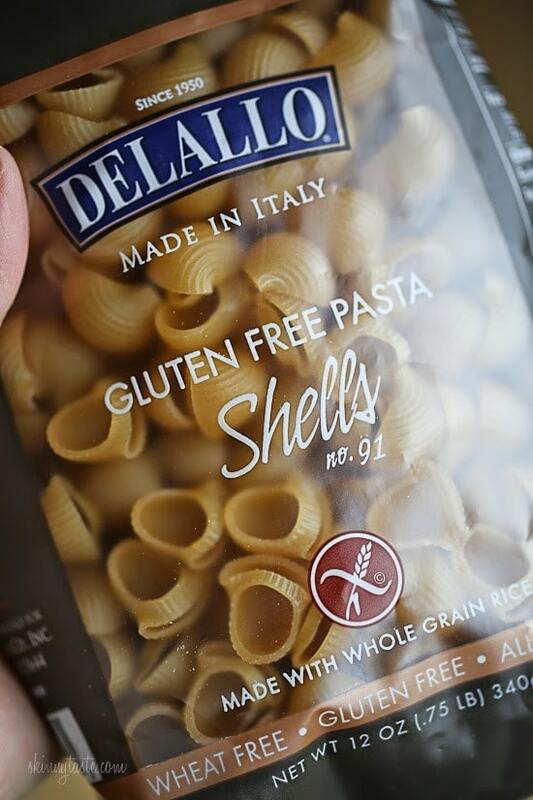 We couldn't find DeLallo pasta shells so we used a brown rice pasta instead. Highly recommend! Thank you! I made this last night exactly as instructed and it was fantastic! Can't wait for leftovers. Very easy and very tasty. Thank you! 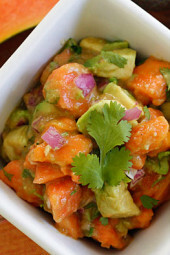 I love this recipe but have gone…Paleo! Am thinking king of converting the pasta to sweet potatoes and skipping the beans. Will let you know how it comes out! I made this last night for dinner. 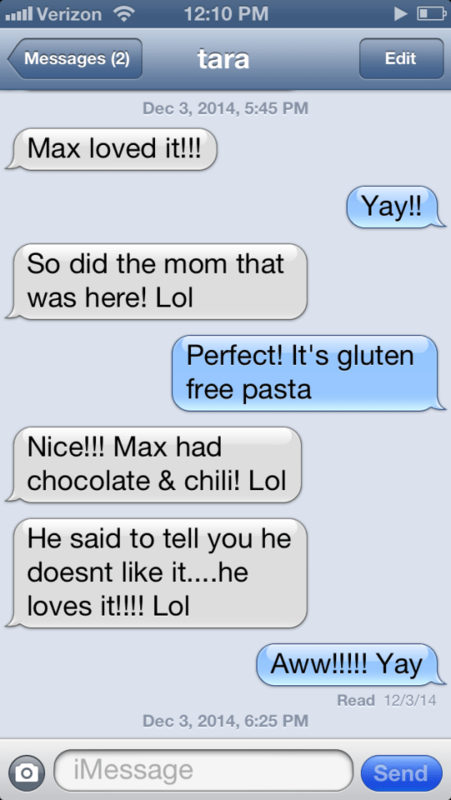 Even my overly picky 9 year old step son had a second helping. Awesome recipe, thank you! Sounds delicious! How do I adapt this to my crockpot? i made this last night – so delicious! i cant wait to finish up this batch so i can make another one! We LOVE this recipe! I'm about to make it for a 3rd time and I'm salivating. Another winner, Gina! This was absolutely amazing. I made this the first time and my husband loved it so much, I mentioned making it again and HE went out to the supermarket to get the missing ingredients.I do add a little more of the fried beans because my husband loves the thick consistency. Thanks again Gina for yet another amazing recipe. How could I convert this to a crock pot version? Thanks! Made this tonight after tagging it in feedly a few weeks ago. So delicious!!!!! I added another can of beans… chili beans and used a cup of water instead of 1.75 and it turned out so so so so so good! Thanks Gina! This is CRAZY good. I didn't have quite enough turkey (used a little less than a pound instead) and compensated by using more of the refried beans which made it super creamy. We will definitely eat this again. Hi. What would the calories be if I made this with no pasta? Random question but why do you specify browning the turkey with a wooden spoon? I just made this. It is ridiculously delicious! I do not eat leftovers. The food has to be excellent for me to eat leftovers. Well this dish is SUPERB! I have literally eaten this for lunch and dinner the past 2 days. I am eating the last of the leftovers right now as I type this and I am sad it's almost gone! My only substitution was I used Mexican Cheese instead of Cheddar and mmmmmmmm so good. This will definitely be made again the Very near future! This recipe was sooooo goooood! I was actually disappointed when my husband took the leftovers for lunch and left me with pizza. I did have to make a few substitutions due to what I had. I substituted homemade salsa for the rotel tomatoes and black beans for pink beans, also whole wheat noodles. Thank you, thank you, thank you. I made this yesterday and my husband and I loved it. We used mini-bow tie pasta since we were not concerned about the gluten. We served it with a few crushed up corn tortilla chips and a dollop of plain Greek yogurt. Delicious! Leftovers are great, too! Made this last night and it was delicious! I didn't have the GF pasta on hand, so had what I had and it still came out so good!! Made this last night! It was really good. In the beginning I wasn't really sure since it didn't look thick enough, but once it was all said and done– it was perfect! Followed recipe exactly. Would def make again!!! Serving size is perfect, lots of food! I made this for dinner tonight, and it was just FABULOUS. Filling, flavorful, and really good for you. Based on comments here, I reduced the pasta amount a bit (down to 6 oz.) and also reduced the water a bit to compensate. Can't wait for the leftovers! Made this tonight and it was AMAZING! Thank you so much for all the hard work you put into this blog. And I just picked up your cookbook at Walmart last night! I got my sticky notes out, intending to tag the recipes that looked good and that I wanted to try… Needless to say, I tagged almost the whole book! Thanks for making healthy eating taste so delicious!!! would it be possible to use cauliflower instead of noodles? Can you use a taco seasoning packet instead? I have several in pantry that I'd like to get rid of? I made this last night and it was wonderful!! Perfect for the whole family includings kiddos!!! Just made this for dinner and it is delicious – a definite winner! My husband says it needs to become a regular dish in our house! Thanks Gina!!! This was so good, smelled great cooking, was filing, delicious and got rave reviews. I served it with a salad. This will be a family favourite from now on. Thank you for this idea! I did the same and it looks so much better. I made this last night. It was terrific! It ended up simmering on the stove (sans pasta) for several hours. Then I added the pasta in to cook right before serving. Not sure if the long simmer made a difference. It was so easy and the whole family loved it, even the kids who are not fans of whole beans. Just made this tonight, and loved it! I can't wait to eat it all this week for leftovers! Chalupas! Great lunch or dinner. I use store bought chalupa shells and ff refried beans, pickled jalapeño slices and either guacamole or low fat cheese (sometimes both!). Broil it in oven for a couple of minutes. For topping I chop iceberg lettuc and tomatoes and toss it with salsa. Yummm! Family fav and quick and easy. I thought about trying it tonight…did you try it yet? That is the same question I had. I have made it in the crockpot before and it was great! I cooked the meat ahead of time but otherwise just threw everything together and let it cook for several hours. This dish is the definition of comfort food. I think I could eat it everyday. Great job, love this soooo much. It might be your best. This looks delicious! 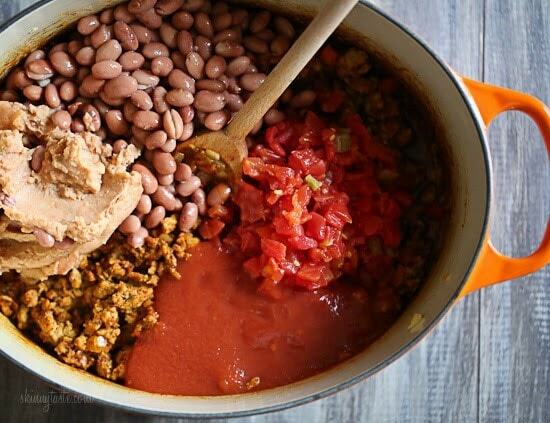 Can you recommend the brand that you use for the canned refried beans?? I normally prefer homemade refried beans, but sometimes there just isn't time, and this looks so easy to make. Thanks!! I'm not sure what Gina uses, but Trader Joe's refried beans are amazing! It's a purple can. I made this last week and it was delicious! I accidentally used 15 oz of tomato sauce and used quinoa noodles and it was still fantastic. Great comfort food! If you like it spicy I highly recommend shredding a little habanero cheddar on top. Made this last night and DH gave it a B+. Have to query him tonight about what would have made it an A. Cut down slightly on the pasta as above mentioned, diabetics on board. Some how I ended up with a trifle too much liquid-maybe bcuz of cutting down on the pasta. Will make this again for sure. I made this last night. I was so good. I reduced the pasta down to 4 oz and used whole wheat pasta (diabetic in the family). I was surprised that even 4 oz of pasta was quite a bit. I had to add little extra water but it was perfect! I wished I had more leftover. I am the only one on weight watchers so I limited myself to just a cup but everyone else went back for more. I will be making more to freeze and pack up for lunches. 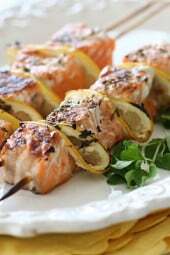 Thank you for your wonderful recipes I really enjoy making and serving them. Looks amazing. Can leftovers be frozen? Think this could be made minus the beans? Can this be frozen? Or is that not recommended? I'll be trying this one for sure! Just wanted to let you know that I've started cooking almost exclusively from your recipes. My husband and son are both incredibly picky eaters but your recipes are always a big hit. I've recently started eating gluten free because of some digestive issues and am so thrilled that I can continue to make so many of your recipes. Thanks so much for doing what you do so well!!! Made this tonight. I couldn't find the gf pasta one my way home so used what I had on hand (regular mezzo rigati). It was delicious. My husband and 3 year old ate it. The 2 year old appears to be on a hunger strike. It was a but more watery than it looked in the pics – not sure why. Would like it less so but still tasted really good! Mine is cooking now and only has a little left to cook, and is definitely more liquidy than I expected. Way more like a soup than a chili right now. I may let it simmer a while longer than the recipe suggests. Looks good!! I am thinking of making this for my friend and her family…she is going through radiation for cancer. Would this be OK to make ahead, and then when they reheat they can add the cheese? Or would the pasta get mushy? I would like to know this, too. Or if it can be frozen. It’s great heated from the refrigerator, but it kinda sucked frozen. Making it for the 3rd time right now and I always eat all the leftovers out of the fridge. Sooo yummy! I don't know if you're familiar with "Cook's Illustrated" or not but they do lots of product testing and they've never steered me wrong. They recommend "Lodge" color enamel 6 quart Dutch oven. I purchased one several months ago at Target and I love it! There is one on clearance on their website right now though I'm not sure of the size. Hope this helps! I am currently making this recipe now. I'm also using a lodge dutch oven. They're very nice to cool with. Just remember that the rim at the top isn't coated, so don't let it soak or you'll get some rust. I’ve had a large Le Creuset Dutch oven that works great for recipes like this, but that I also use all the time for other things. They’re pricey, but you can find seconds at outlet stores–seconds that nobody would ever know are seconds. I’ve had it for maybe 7 or 8 years and it rocks! I would've been set with just the taco chili, but it's even better with the noodles! Yum! Yes trust me, it is! It says to use uncooked pasta, I am wondering if that'll be cooked all the way thru towards the end or should i cook it ahead of time. Uncooked! It will cook to al dente after it simmers in the chili. So good ???? Would it work to substitute rice for the GF noodles?